Heavy ink (high color density) not recommended. How can small businesses afford professional business letterhead printing on a relatively small budget? PrintSafari.com allows businesses to order custom letterhead online at high quality by offset printing. 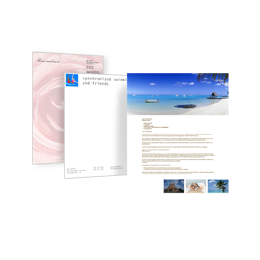 Cheap letterhead printing can incorporate colors and graphics to create a professional look. This is vital for companies who need to make a great impression, especially start-up businesses. Ordering custom letterhead online takes very little time, but is well worth the investment. Business letterhead printing can be a time consuming process, especially when using an older printing company. By ordering custom letterhead online, a small business can create exactly the right impression with a professional business letterhead printing. With a choice of papers, inks, and other options, cheap letterhead printing will help businesses stand out. Rapid business letterhead printing is one of our specialties. With almost instantaneous PDF proofs, ordering custom letterhead online becomes a simple matter of choosing a style, clicking the submit button, and waiting for the results. Our talented team of graphic designers and experienced printers will process your order in only a few days. It's easy to try out our cheap letterhead printing services. Get the results you need with cheap letterhead printing.